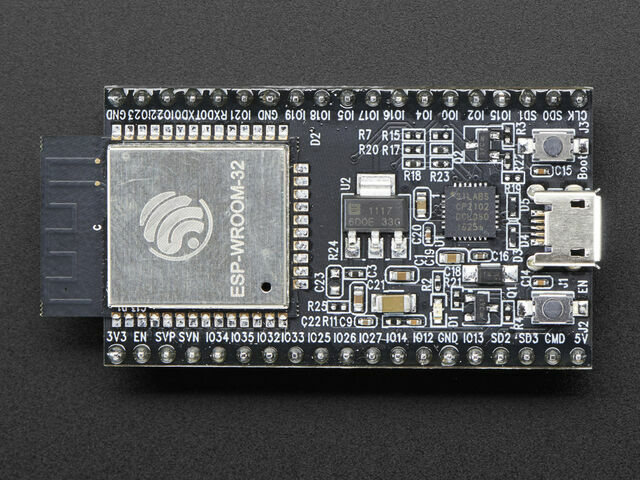 The Espressif ESP32 Development Board (image attribution: Adafruit). See the corresponding section of tutorial: Getting started with MicroPython on the ESP32. It also includes a troubleshooting subsection. Note that the temperature sensor in the ESP32 will typically read higher than ambient due to the IC getting warm while it runs. This effect can be minimised by reading the temperature sensor immediately after waking up from sleep. Once the network is established the socket module can be used to create and use TCP/UDP sockets as usual, and the urequests module for convenient HTTP requests. Available Pins are from the following ranges (inclusive): 0-19, 21-23, 25-27, 32-39. These correspond to the actual GPIO pin numbers of ESP32 chip. Note that many end-user boards use their own adhoc pin numbering (marked e.g. D0, D1, ...). For mapping between board logical pins and physical chip pins consult your board documentation. PWM can be enabled on all output-enabled pins. The base frequency can range from 1Hz to 40MHz but there is a tradeoff; as the base frequency increases the duty resolution decreases. See LED Control for more details. On the ESP32 ADC functionality is available on Pins 32-39. Note that, when using the default configuration, input voltages on the ADC pin must be between 0.0v and 1.0v (anything above 1.0v will just read as 4095). Attenuation must be applied in order to increase this usable voltage range. Despite 11dB attenuation allowing for up to a 3.6v range, note that the absolute maximum voltage rating for the input pins is 3.6v, and so going near this boundary may be damaging to the IC! Currently all of sck, mosi and miso must be specified when initialising Software SPI. There are two hardware SPI channels that allow faster (up to 80Mhz) transmission rates, but are only supported on a subset of pins. By default NeoPixel is configured to control the more popular 800kHz units. It is possible to use alternative timing to control other (typically 400kHz) devices by passing timing=0 when constructing the NeoPixel object. TouchPad.read returns a value relative to the capacitive variation. Small numbers (typically in the tens) are common when a pin is touched, larger numbers (above one thousand) when no touch is present. However the values are relative and can vary depending on the board and surrounding composition so some calibration may be required. There are ten capacitive touch-enabled pins that can be used on the ESP32: 0, 2, 4, 12, 13 14, 15, 27, 32, 33. Trying to assign to any other pins will result in a ValueError. For more details on touchpads refer to Espressif Touch Sensor. The WebREPL daemon listens on all active interfaces, which can be STA or AP. This allows you to connect to the ESP32 via a router (the STA interface) or directly when connected to its access point. In addition to terminal/command prompt access, WebREPL also has provision for file transfer (both upload and download). The web client has buttons for the corresponding functions, or you can use the command-line client webrepl_cli.py from the repository above. See the MicroPython forum for other community-supported alternatives to transfer files to an ESP32 board.